Welcome to our New Codeless Builder 🙂 ! As being on this business for a while now, we are constantly working for the best Builder to create a good website. When it comes to ‘good’ builders, we all know all the promises and marketing process that make us believe that a certain innovative or professionally built one will be the key of saving us from the long hours of work. And when you buy the promised wordpress theme, the expectations may not meet the reality. We are doing something different now. It better to see and then believe! You will talk about our new Builder and in the meantime, you can also try it for free. 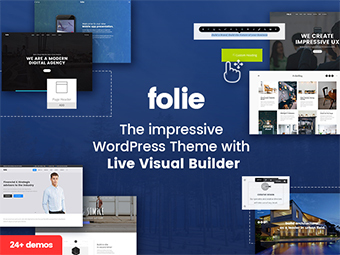 Watch the whole presentation post of Folie WordPress Theme here. Why should you try our New Codeless Builder? This is an innovative page builder technology that will change forever the way you built websites. It has the ability to change the site directly without annoying refresh waitings. Everything will change in seconds and you will see it live. Simple and intuitive! You don’t need to refresh the site or change the tabs to see the changes. It is practical and most of all, it is fun to use. When the customizer is loading, you will always see some useful tips that include shortcode functions on how to customize something. You can press SHIFT and by dragging the mouse you can adjust the margins and paddings. Just like Photoshop! You can click on every text that you want to modify and a toolkit for formatting text will appear. Inline editing! You can press SHIFT + CTRL + click on an element to modify its options. You can clone, copy and paste the element properties to an other one. You can copy and paste an entire element not only on the existing page, but also on every page that you like. You can add portfolios, blog, testimonials and other components as elements from the Builder. You can also add elements on the Header Builder. Yes, now even the header has a Builder! Let’s say that every page of your website will be displayed as a white canvas, in which you add your items fitting your requirements. No more random rules and boundaries! The Builder will add New Content on the Fly. Adding new content to your website is the easiest process now! If you want to append or prepend elements to a section or column simply click the Add Icon, a new block with all elements will appear. We have developed the first Customizer 100% on the fly when you can see any change. Its like creating a website from Word. You have only to select the demo and plugins, theme options, menu, widgets, images will be installed automatically. Enhanced installation speed that will give the exact replication of the online demos. For the first time on this market we provide predefined elements for each element of the builder. Content Blocks are saved sections or group of sections you can use over and over. So easy! Codeless Team have used the best Technology inspired by Medium Editor and SquareSpace. 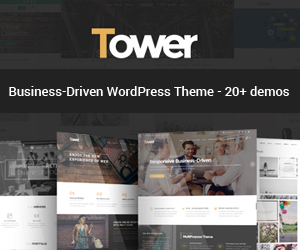 This theme will start a new era for WordPress themes. draggable elements and spaces – You have only to type Shift and drag your mouse to change padding and margins. inline text edit and live changes – Amazing speed and the live preview of anything will let you build beautiful websites faster. page to page communication – Communicate from page top page without losing what you have made before. live header builder – Header can be built with drag n drop and you can add visually any element. There is no limit! live layout changes – Change the theme layout in a few seconds! new innovative setup wizard installation – The Setup Wizard will make sure that all the Plugins, Widgets, Demo Data, Customize Options and Menus will be installed at the same time and successfully. accelerated animations – Now you can add animations to every element at the same panel that you customize the general options. optimized code – Easy to edit, SEO ready! narrated video tutorials – We have improved our video tutorials by adding narration to them, as required by our customers 🙂 . adaptive images – Folie have specific images size for any device. new innovative design – Check out our pre-created demos and choose the one that fits you best. But you can see the full list of the features here. What’s new about Folie WordPress Theme? Watch us explain all of this new features and how they work on our youtube chanel here. What does the theme cost? The Folie Multipurpose WordPress theme it is on sale on ThemeForest on Envato Market for $60 for a regular license. It is quality checked by Envato, it has future updates, 6 month support from Codeless. With this price it will be totally worth it! Create you new website in minutes, save plugin money and you also receive a cross internet browser theme, retina ready, that will make your site to be beautifully adaptable with any type of device. Folie theme it’s also WPML optimized, so you can translate your site in any language and be happy with it. 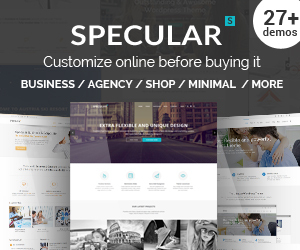 Buy this WordPress theme to save $600 on premium plugins, demos and photos included for free.